A great many gardeners seem to be intimidated by pruning roses. Some think it is extremely difficult and precise work, while others are afraid that they will end up killing their roses if they don't do it properly. The fact is neither is true. Like most things, pruning is something that takes practice and time, just like everything else you've learned in your garden. You didn't just wake up one day and discovered that you knew everything there is to know about gardening right? The fact is learning how to prune rose bushes is quite easy once you've done it a couple of times and there are tremendous benefits to doing so. For starters you will keep the plant healthy by removing parts that are dead or dying. You will also encourage new growth on the plant which is always a good thing, and you will improve the overall health of the plant by maintaining proper air circulation through the center of it. This is critical towards allowing the leaves to dry out in between waterings and helps prevent diseases like blackspot. 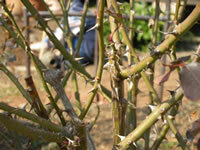 Pruning rose bushes is most often done in the early spring before the leaves start to bud. This makes it much easier to see what you are doing and you are not removing parts that the plant has yet begun growing leaves on. Some growers will say the best time to prune is late fall or winter, and there is a lot of conflicting information on the timing, but I have always done my pruning first thing in the spring when the weather breaks and have always had great success with my roses. 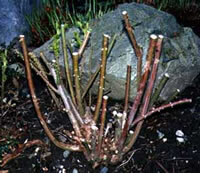 The first thing you need to do when learning how to prune rose bushes is remove all the dead wood from the plant. These will be obvious because they will be dry and desiccated and probably will just break off by hand. I will also remove any canes that look like they are diseased or heavily discolored for any reason. My logic is if they aren't healthy canes than I'd rather get rid of them and let the rose grow news ones rather than take my chances that they might come back. The next thing you will want to do is go through and start cutting back the lateral canes that overlap one another. The reason you do not want to let these go is because once the leaves open up, these canes will compete with one another for sun light. You don’t want your rose bush fighting with itself to grow so clean these up. On smaller rose bushes like the miniatures and the teas, this is less of a concern than it is on the much larger roses because there are fewer lateral canes. I have a hybrid tea rose bush growing in front of my house that always seems to grow straight up and rarely overlaps its canes, so not all roses will need this step but you should look over it anyway. This important step in learning how to prune rose bushes gets most complicated when you are tackling a large climbing rose because those grow everywhere, and in every direction. I always advise gardeners that when you are trying to tackle a job that you find intimidating, take it in small baby steps until you feel more comfortable with the overall project. If you've made it this far then you've already gotten through the hardest part of learning how to prune rose bushes and the rest is easy. By now you should have a pretty clean looking rose bush with nothing but healthy canes remaining and few if any crossing over one another. The next step is to determine what to do with the remaining canes left on the plant. This is where you have to understand the type of rose that you are growing because you will prune a climbing rose much different than say a hybrid tea rose. 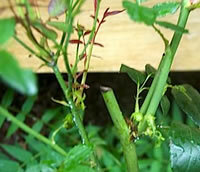 For most non climbing roses, you will generally cut back the remaining canes about one-third of their current height. If you live in a colder climate you may find that you have to cut them back halfway. For climbing roses, you are basically just pruning them to the desired height and shape that you are looking for. Personally, I like my roses to grow as big as they can get so I tend to prune on the light side during this step. Pruning rose bushes is as much about personal preference as anything else. Even if you make a mistake, the plant will usually outgrow it in the first season anyway. The final step in pruning rose bushes is mostly cleanup. After all that you probably have a nice size pile of cuttings laying at your feet. Make sure that you bag all these up and throw them away in the trash. Never let them lay around the base of your roses and never throw them into the compost pile. Many rose diseases transmit through spores that can lay dormant even over the cold winter months and will just ait to re-infect your plants the following spring. This is also the time when I rake up all the dead leaves and loose debris that collects around the base of my roses. Letting decaying plant material sit for long periods of time will be an open invitation to various pests and diseases to come and take hold of your roses. Dispose of these with the cuttings. Lastly, I always give my roses a fresh layer of mulch after I'm done pruning them, even if I'm not quite ready to mulch the entire flower bed yet. Mulching will keep the soil temperature cool, help retain some moisture, and most importantly it puts down a barrier between the leaves of your roses and the soil below it where bacteria and pests live.